Strengthens the defense mechanisms of the skin. 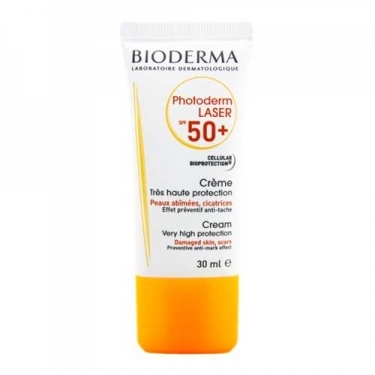 DESCRIPTION: Photoderm Laser Crème SPF50+ from Bioderma is a specific facial sunscreen for skin that is subject to dermatological treatments. Formulated with the patent Bio Cell Protection and Enoxolone, it offers a strong anti-inflammatory action, necessary after dermatological treatments, while protecting against UV rays and external aggressions. SPF50 +. Hypoallergenic and non-comedogenic. Without perfume. Apply evenly on the face before sun exposure. Repeat the application every 2h. Ideal for skin subjected to dermatological treatments.